Go to the “Customers” page in the “Customers” menu, find the customer you are looking for, and view his or her customer profile. In that profile, scroll down to the “Carts” section, where you can see all the carts created by this customer. Go to the “Shopping carts” page in the “Orders” menu. The carts are sorted by ID. Find the customer you are looking for. In both cases, you can click the “View” icon to see the content of your client’s cart, and use this information to improve your commercial performance. In the cart’s page, the most important information is in the “Cart Summary” section, where you can see what products the customer chose to purchase, the price of each item, the quantity they put in their cart, and the total value of their cart. Cart abandonment often means that a sale has been lost. 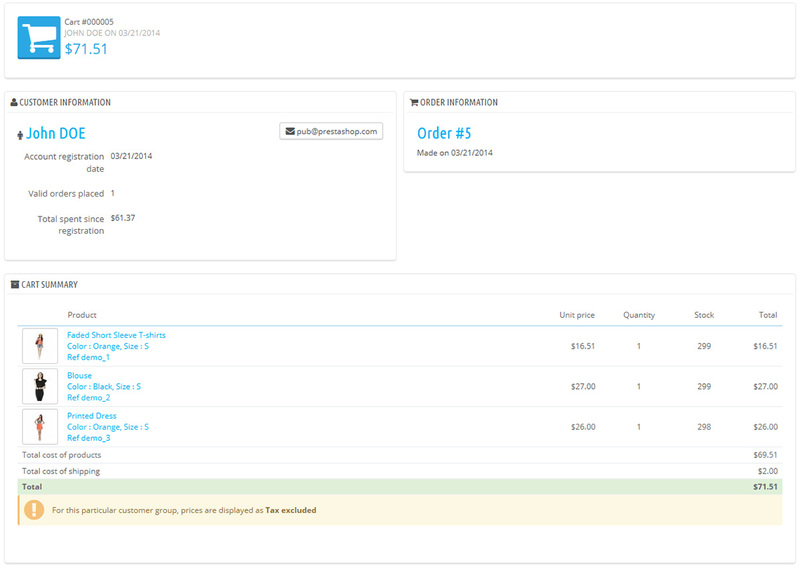 The “Shopping cart” page indicates the carts that have not been turned into proper orders, and it is up to you to remind the customer that they can still come back to finish their purchase. Abandoned carts (or “ghost carts”) will have a delete link at the end of each row, while carts without delete links are processed carts, i.e. the purchase has been confirmed and you are supposed to send the products. By default, it is up to you to contact the customer about his abandoned cart. You can install the Reminder module, which is available in the default installation and enables you to send vouchers to those who have abandoned their shopping carts, or to those who you want to thank for their order, to the best clients to thank them for their purchases and for being faithful… Note that this can lead to abuse: some customers might abandon carts on purpose in order to receive a voucher.